I've got a 79 Stern Meteor I'm trying get working. 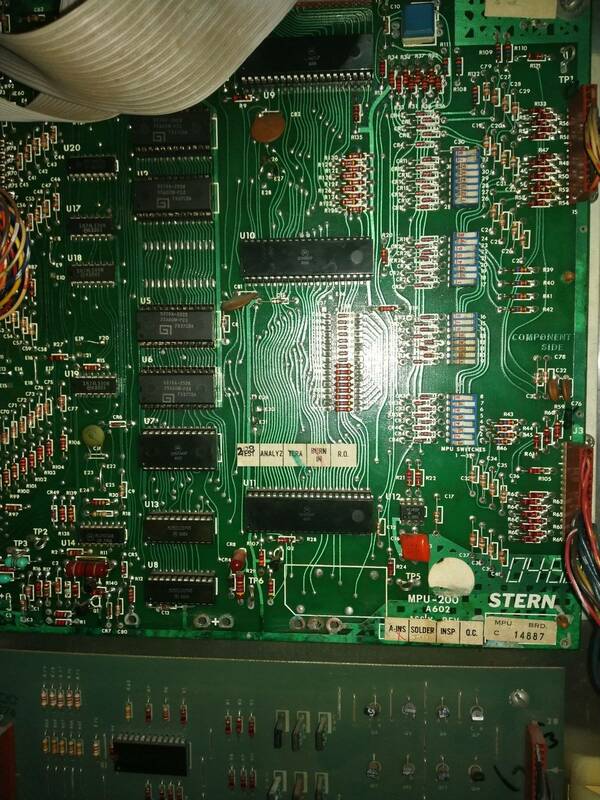 I've checked all connectors and solder joints on the MPU. They look great. However once I add a credit to the machine and hit the button, the sound starts looping 2 low tones over and over like its stuck. Any ideas on what that might be or how to solve it? sure you got the top connector on the right way? the top connector was on backwards. Is it the original MPU or aftermarket? I've posted pictures of the new sound board and the MPU. So my guess is that it's original. The sound did work a few times (hit and miss) when we 1st got the machine. That was before all the work on it. Would stuck drop targets do this? I'm not sure what else I could have borked. If it was working properly at one time, then I would lean more towards the ribbon cables being bad. If it was always messed up then I would suggest getting new 5101's. This game and other SB 300 sterns need the fast access 5101's to play their sounds correctly. I've only owned a pinball machine about a week. I can't find anything that say's "5101" on it in the Meteor boards. Also I wouldn't know a fast 5101 from a slow one! Also how can the ribbon cables just go bad sitting there? 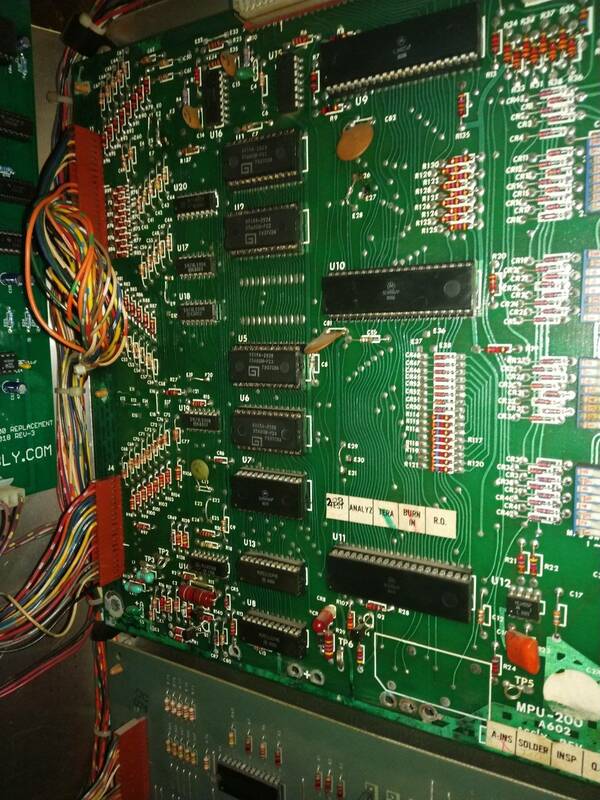 I included a close up picture of the MPU, hopefully you could point out what needs replacing. The ribbon cables are notorious for going bad in this era of stern. The guy that you got the sound board from sells a new set. The 5101s are at u8 and u13. Start with the ribbon cables, and then we can diagnose further is need be. 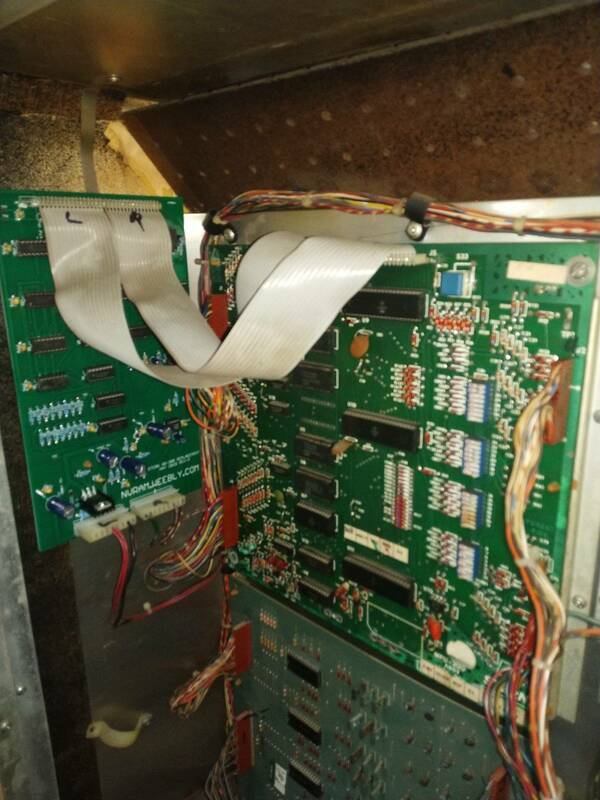 I replaced both ribbon cables and the 5101 chips at U8 and U13. No dice. Still does the exact same thing. I WAS working intermittently when I got it. Now not at all. Could a stuck target do this? I there somebody who could go through the board and test it out? I am having the sane ussue and the ball isnt ejecting. I have been told to check the fuse on the bottom of the playfield and the solenoid. My fuse is good. So that isn't the issue. Is your sound looping too? All my fuses are good. Are your coils firing when you run a self test? Does solenoid test work? If no check the fuse under the PF near the flippers. I think the background noise is continuously starting over because the game is not feeding the ball to the shooter lane is my guess. Tries to feed the ball to shoot lane. Coil doesnt fire. Game sees ball is still in trough. Does end of ball routine which makes the background noise starts over. And that goes on for a never ending loop.